This weeks I have an interesting book that I just started hearing about last week when it came to an end. When I heard the review for the final issue on iFanboy’s pick of the week podcast, it immediately caught my attention. So while I was in my local comic shop this week I grabbed the first two trades of the book. 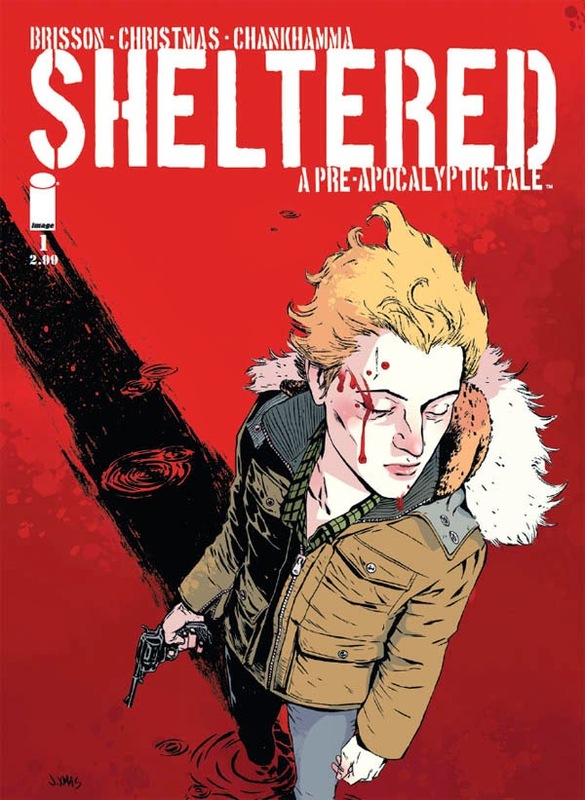 Sheltered is the story of Safe Haven. An off the grid community of doomsday preppers who are working together to stock up on everything they will need in case of the end of the world or the government turns on the citizens of the United States. The problem is that one of the kids in the community puts together that the super volcano in Yellowstone National Park is about to erupt and the community only has enough supplies built up for a smaller group of people to survive for three years. The discovery leads the children to make a move and kill their parents under the command of Lucas, the older kid who is predicting the imminent eruption. But the story centers on Victoria. A new comer to Safe Haven who is away from the community with her best friend when Lucas leads the rest of the kids to make their move on the parents. But she is called back by the sounds of gunfire on the community. And when she returns she finds her father being dragged to a burning pile. This leads to Victoria and her friend Hailey trying to figure out what happened to the parents, and why it happened. But the real strength of the series is the inevitable crumbling of the community. They are only kids, and the oldest of them is maybe in his mid teens. So the longer the kids are on their own without the adults the more they revert to being like kids left home alone with a house full of food they aren’t supposed to eat and movies they aren’t supposed to watch. It really starts to take on a Lord of the Flies feel. Right down to the fact that they start to make kid decisions in adult situations which has the expected result. Brisson and Christmas have put together a great series. Even though the inevitable always seems to happen. They make it interesting to see how it is going to get there. And the art of Christmas is great at conveying the emotion of a scene. There are moments where I had to do a double take to figure out which characters were on panel together, but it wasn’t very often. And it usually occurred in scenes at night, where the panel was designed to be darker. I am really impressed with this series, and look forward to getting a hold of the last trade when it comes out. It really stands out in the current comic landscape.